An International Launch Services Proton rocket and Breeze M upper stage on Tuesday orbited a communications satellite for the U.S.-based Dish Network direct broadcasting service. After lifting off from the Baikonur Cosmodrome in Kazakhstan at 1831 GMT (1:31 p.m. EST), the 19-story Proton launcher soared east from the historic space base and released a Breeze M upper stage on a suborbital trajectory. The Breeze M stage ignited five times to place the EchoStar 16 satellite in an elliptical transfer orbit. The rocket targeted an orbit with a high point of more than 22,200 miles, a low point of 1,512 miles, and an inclination of 29.5 degrees. ILS and the Russian space agency announced the Breeze M stage released the EchoStar 16 payload more than 9 hours after liftoff. The launch was successful, officials said. The launch of EchoStar 16 came the same day ILS announced the immediate departure of its president. Frank McKenna, who led the U.S.-based launch services firm since October 2006, is being replaced by Phil Slack, the company's vice president and chief financial officer, according to ILS. ILS, which is owned by Russian Proton contractor Khrunichev, did not specify a reason for the management change. Two Proton/Breeze M flights have failed since August 2011 on Russian government missions conducted under the management of Khrunichev. Although ILS had no part in the botched launches, commercial Proton missions use the same vehicle. The director general of Khrunichev resigned in the wake of the of the most recent Proton/Breeze M failure in August. ILS has announced two commercial launch contracts this year for the Mexsat 1 satellite and a payload for AsiaSat of Hong Kong. The missions are due for launch in 2013 and 2014. 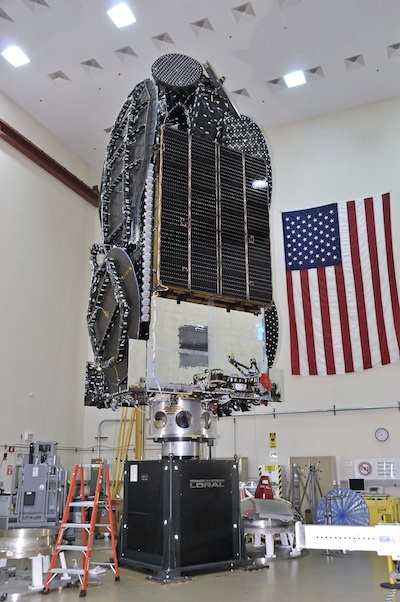 EchoStar 16 will raise its orbit to an altitude of 22,300 miles over the equator in the next few weeks. The craft will also extend its solar panels and activate its communications gear for testing. The satellite, which weighed 14,660 pounds at launch, was manufactured by Space Systems/Loral. The spacecraft will be positioned at 61.5 degrees west longitude in the geostationary belt for its 15-year design life. It will be leased by EchoStar Corp. to Dish Network, a leading provider of direct-to-home television programming in the United States. EchoStar 16 also carries a disc with 100 images of humanity and nature - part of a project by artist Trevor Paglen called "The Last Pictures." The images were micro-etched on a silicon disc encased in a gold-plated shell. Satellites in geostationary orbit should remain in space for billions of years. Unlike spacecraft like the International Space Station in low Earth orbit, communications satellites thousands of miles from Earth are not pulled back into the atmosphere by drag. "They will never come back to Earth," Paglen said. "They're never going anywhere. Over the last 50 years, the humans have built a ring around our planet, not unlike the rings of Saturn, but instead of being made of dust and debris, the ring around Earth we've created is made of machines. What's more, this ring is now a permanent part of our planet." After consulting with scientists and other experts, Paglen selected 100 images to showcase modern society. "These are real momuments of the contemporary moment," Paglen said. "'The Last Pictures' is a project to mark one of them, a collection of images that might explain something about why these spacecraft are there, and maybe explain something about what happened to the people that made them, and why the people that made them are not there anymore." EchoStar agreed to host the project on its satellite. The project was sponsored by Creative Time, a New York non-profit which commissions and presents public art projects. "With the successful launch of EchoStar 16, ILS Proton has launched five of the satellites in the EchoStar fleet," Slack said. "We are very proud to have served EchoStar in their expansion over the past ten years." EchoStar 16's launch marked the 10th Proton flight of the year. Two more ILS launches are on tap before the end of 2012. The launch of Yamal 402, a communications satellite for Russian oil and gas giant Gazprom, is scheduled for liftoff Dec. 8. The Satmex 8 broadcasting satellite will launch on an ILS Proton rocket in late December to serve Mexico and Latin America.